nowadays Greek Gravieras have no connection whatsoever with the Swiss version of the cheese, so that nowadays Greek Gravieras have no connection whatsoever with the original Swiss version. There are three Gravieras registered as PDO in Greece: Graviera Agrafon (produced in Western Thessaly and Evritania), Graviera Kritis (produced in Crete) and Graviera Naxou (from the island of Naxos in the Cyclades). Production of exceptional Graviera cheese –although not registered as PDO– also takes place in the islands of Tinos (from cow milk), Lesvos, as well as in the region of Epirus and the municipality of Amfilochia. 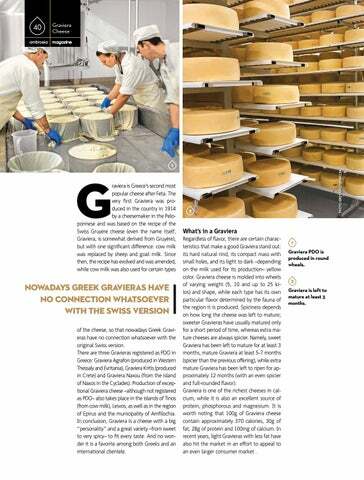 In conclusion, Graviera is a cheese with a big “personality” and a great variety –from sweet to very spicy– to fit every taste. And no wonder it is a favorite among both Greeks and an international clientele. What’s in a Graviera Regardless of flavor, there are certain characteristics that make a good Graviera stand out: its hard natural rind, its compact mass with small holes, and its light to dark –depending on the milk used for its production– yellow color. Graviera cheese is molded into wheels of varying weight (5, 10 and up to 25 kilos) and shape, while each type has its own particular flavor determined by the fauna of the region it is produced. Spiciness depends on how long the cheese was left to mature; sweeter Gravieras have usually matured only for a short period of time, whereas extra mature cheeses are always spicier. Namely, sweet Graviera has been left to mature for at least 3 months, mature Graviera at least 5-7 months (spicier than the previous offering), while extra mature Graviera has been left to ripen for approximately 12 months (with an even spicier and full-rounded flavor). Graviera is one of the richest cheeses in calcium, while it is also an excellent source of protein, phosphorous and magnesium. It is worth noting that 100g of Graviera cheese contain approximately 370 calories, 30g of fat, 28g of protein and 100mg of calcium. In recent years, light Gravieras with less fat have also hit the market in an effort to appeal to an even larger consumer market . 1 Graviera PDO is produced in round wheels. 2 Graviera is left to mature at least 3 months.